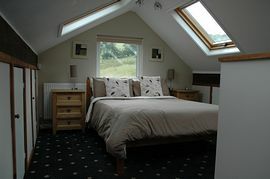 The cottage offers one first-floor Master Bedroom enjoying unspoilt views toward the Trig Point and Offas Dyke Trail. 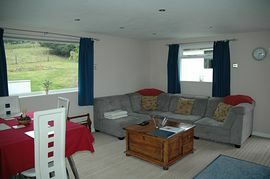 A ground floor lounge/dining room with picture window (Trig Point and Offas Dyke aspect) has a corner sofa, television and DVD player (with a selection of films and books), stereo with connection for an MP3 player and a glass extendable table for meals and serious map reading. 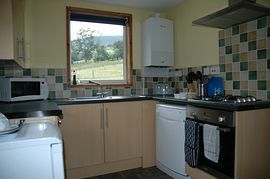 The kitchen is equipped with dishwasher, microwave, fridge and cooker as well as the usual plates, knives, forks, cups and glasses you would expect to be able to drink, eat, cook and clean. The shower room offers a powerful thermostatically controlled shower and large cubicle to help you wake, clean or relax after a serious days holidaying. 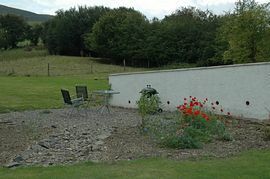 Outside there is a private garden with seating area and BBQ with access to the main garden. The garden has been opened before through the National Garden Scheme (NGS) yellow book to raise money for charity and you are invited to look around the garden and chat to the chickens and children during your stay (not kept in the same pen!). Snowdonia with it�s amazing mountains, Chester with it�s great shops and race course, Llangollen and all it�s water sports and climbing facilities, Anglesey and the stunning North Wales Coast are all within easy driving distance of the cottage. If you fancy some mountain biking Coed Llandegla is a 5 minute drive and there is secure storage if you want to bring your bike along. If you enjoy walking you can explore the Clwydian Range with access from the lane up onto part of the Offas Dyke path. Whether you want a relaxing visit or an activity packed stay Celyn Cottage is the perfect setting and a home from home. Bedding for double bed, sheet for travel cot, travel cot duvet and towels. Local Services: Public house 2 miles away serving real ales and great food. Town with all shopping facilities 5 miles away. From Ruthin take the A525 to Wrexham at Llanfair DC after The White Horse pub turn left opposite the school signposted Graigfechan. Turn right at the end of the road signposted Graigfechan. Go past the Three Pigeons Pub on your right and head up the hill out of the vilage. Bear left at the end of the village and go up the hill past Rogers Coaches take the next left and follow the road for 3/4 of a mile Drws Y Nant is the 2nd house on the left the cottage can be found at the end of the drive with it's own parking area. If you are using sat nav when it says you have arrived continue on the road you are on for another half a mile and the house is on the right. £60 per night January, February, March, May, June, September, October, November. 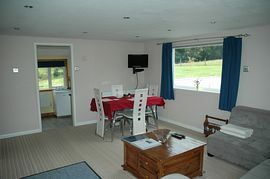 £70 per night April, July, August and December. Minimum stay 2 nights mid week bookings available at 10% discount. Open all year except for 3 weekends when the in-laws come to stay. Thank you so much! We've enjoyed our lovely peaceful stay SO much. It's felt like a home away from home and we very much appreciated all the little homely touches. You've thought of absolutely everything Kindest Regards, S & B. Thank you very much for all your help and great hospitality. We enjoyed our stay it was lovely and the cottage was lovely as well, exactly what we needed, Kind Regards L and A. It was a great stay. thank you for a lovely cottage and a warm welcome. Will definitely be back. love S and B We've enjoyed our week very much - thank you both for everything. Your garden is stunning and like the cottage comfortable and light. G & J Thank you for providing such a delightful place to stay and thank you for the welcome pack! Many thanks and all good wishes, M & S Thank you for welcoming us to your lovely little hidey-hole; we've had a wonderful,relaxing time & thoroughly enjoyed staying here. We really appreciated your friendly, helpful attitude, whilst letting us get on with doing our own thing we think your kids are delightful. Hope your next guests have as wonderful a time as our stay. Best regards K & M Really enjoyed our stay in your cottage. We came for a relaxing break to re-charge our batteries and we certainly did that. The cottage and surrounding area is lovely and the gardens are a credit to you both.Our recommendation for food would most definitely be The Three Pigeons about a mile from the cottage a nice friendly pub. Thanks again L & L.